October 31st, 2016 — According to a lot of research, omega 3 benefits each of the body’s systems in its own way. The greatest benefits can be found in the heart and the brain. In places where other fats clog the arteries and contribute to heart disease, the omega 3 fatty acids helps to fight off the heart disease in many ways. likely to stick to the walls of the arteries and create clots. HDL is what helps remove the particles of LDL from the blood. 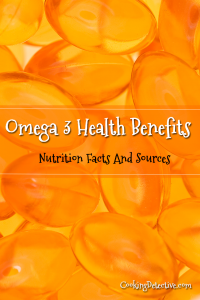 Omega 3 supplements have been known to increase the amount of HDL. The July Tufts Health Newsletter highlights the latest results from the long running Harvard public health study. According to Dr. Dariush Mozaffarian, the new results were among the first to look at the relationship of Omega-3 levels in the blood stream and overall mortality of older adults. “The advantages of eating fish are many,” says Alice H. Lichtenstein, DSc, director of Tufts’ HNRCA Cardiovascular Nutrition Laboratory. “Fish offers omega3 fatty acids and, depending on how it is prepared, is low in calories and saturated fat.” Besides the inherent nutritional positives of fish, she adds, substituting fish (not fried or heavily breaded) for entrées such as steak and quiche pays off doubly. The American Heart Association recommends eating fish at least twice a week, particularly fatty varieties high in omega-3s such as salmon, mackerel, herring, lake trout, sardines and albacore tuna. A “serving” is 3.5 ounces cooked, or about three-quarter cup of flaked fish. The researchers examined 16 years of data from about 2,700 US adults age 65 or older who participated in the long-term Cardiovascular Health Study. Participants, average age 74, were generally healthy and did not take fishoil pills. Rather than relying on dietary questionnaires to measure fish consumption, the study took blood samples at baseline to analyze total omega-3s as well as levels of three specific omega-3s found in fish: DHA (docosahexaenoic acid), EPA (eicosapentaenoic acid) and DPA (docosapentaenoic acid). Overall, study participants with the highest total omega-3 levels had a 27% lower risk of total mortality due to all causes, and in particular were less likely to die of coronary heart disease and arrhythmia. Those with the most blood omega-3s lived, on average, 2.2 years longer than those with the lowest levels. Be happy! Eat more sardines! Seasonal Affective Disorder (SAD) was discovered by Dr. Norman Rosenthal after noticing that his own sluggish mood — first noticed after moving from sunny South Africa to New York — improved after exposing himself to bright light. SAD affects about 8 percent of people in wintry New Hampshire but less than 2 percent in Florida. Lack of sunlight may alter sleep-wake cycles by means of nerve signals from the eye to the brain’s biological clock (the suprachiasmatic nucleus) with the help of melatonin from the pea-sized pineal gland. Although Iceland’s daylight diminishes, due to their near-arctic latitude, from over 9 hours on October 20 to just over 4 hours in December, its SAD prevalence of less than 4 percent is much lower than that of U.S. or European locations with equivalent levels of seasonal darkness. In fact, Icelanders are among the happiest people in the world — despite their 2008 financial crisis, volcanic eruptions, and the predominant winter darkness. In addition to their helpful social support and encouragement of out-of-the-box lifestyles — the mayor of the city of Reykjavik, Jon Gnarr, who is also a comedian, as an example — Icelanders believe that their high consumption of ocean fish and fish oil helps them cope. Oil-rich cold-water fish like salmon, cod, and sardines, fish oil supplements, and some plant-based foods like walnuts contain omega-3 polyunsaturated fatty acids, which research on other mood disorders suggests have an antidepressant effect. We’ve known for quite a while that eating fish correlates negatively with major depressive disorder.